I have to say that I am loving this trilogy more than I ever expected to. It is completely different from anything else I read and I have trouble “letting go” of the books after I’ve read them. I’ve ended each book feeling like it is a 4.5 star book, but then as it settles within my brain and I keep thinking about it for days and weeks after finishing they inevitable turn into 5 star books. I think what I loved the most about this book is that I NEVER knew what was going to happen next. Everything that happened was unexpected, and even when I tried to guess I ended up wrong. Most of the books I read are formulaic (some extremely so) and it’s refreshing to have a book where I have absolutely no clue what is going to happen at any time. No clue. At. All. Katherine Arden has serious storytelling skills. Both books started off slow for me, but once I let myself become immersed in them then they were excellent. It’s hard to write a review when I want to start each sentence with “The thing I loved most was…”. 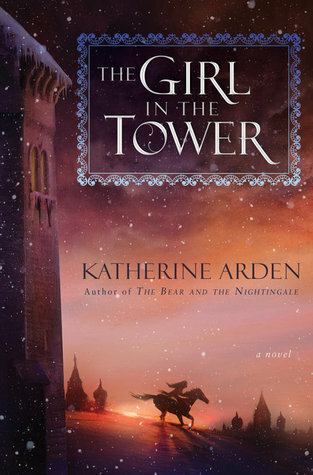 Everything is my favorite thing about The Girl in the Tower, but especially the atmosphere that Arden developed in The Bear and the Nightingale and then continued/evolved/changed as book two progressed. That atmosphere shines through on the covers and they completely represent the books. Cover Love is real with these books. I absolutely loved the covers for The Bear and the Nightingale and was trying to decide if I preferred the American or UK cover better. I ended up with an American hardcover, and it is even more gorgeous than I expected. I imagine the UK cover is the same way, so I believe that this is one series that I will be buying in duplicate. Seriously. I never do that, but these covers are that good. The Delphi Resistance is one of those books that I feel like I’ve been waiting on forever. I read The Delphi Effect last year, and absolutely loved it. I even went so far as to stalk the series on Amazon until the next book was available for me to preorder. The Delphi Resistance begins not very long after the last book left off. I think it would have been helpful if this book included a little summary/reminder of what happened because I had to go back and read the last chapter of The Delphi Effect to refresh my memory. Once I was reminded though, this book kept me up finishing it. It was one of those “just one more chapter” nights until finally I just had to finish the book regardless of the fact that it was 1AM. This isn’t one of those series where you can just jump in with book 2 and start reading. You really have to start with the first book to get the full story, but it’s worth it. I would recommend this for anyone that loves a good paranormal fantasy. If you have an Amazon Prime membership The Delphi Effect is currently available to read and listen to for free. Otherwise both books are Free on Kindle Unlimited (as of 10/27/17). It has been way too long since I last read a paranormal romance, and it felt good to be back. How to Tame a Beast in Seven Days is the first book in Kerrelyn Sparks new The Embraced series. I haven’t read any of her books before, but enough of my friends have raved about her work that I was pretty sure she would be a hit for me. This book was a perfect start to a new series. The world building was detailed and unique without getting bogged down with unnecessary information. It was funny, charming, and still had some heat. It did feel a little long, but it was a quick read because it was so engaging. The next book in the series will be So I Married a Sorcerer coming out at the end of August. I received an advance readers copy of this book that I have chosen to review. 4 Stars + a cliffhanger alert! That cliffhanger! I should have realized before I started reading it, it very clearly says Part One on the cover, but Cover-Lust is real and I couldn’t wait. Balance reminds me of Twilight quite a bit. I’m not exactly sure what it is that makes me draw that comparison. Is it the mousy, inexperienced girl? The inexplicable attraction? The relationship between a rich and powerful male and a very breakable human girl? I love Twilight, so this isn’t a problem for me. My only complaints are pretty minor. The “good side” doesn’t seem very fleshed out to me. I found the good side to feel a bit “clunky” and I didn’t really connect with them (except for Murray). I’m pretty sure that they’ll be more developed in the next book, so I’m not too worried about it. Also, I’m a bit scared of the dad. Scared enough that I had to stop reading and finish it during daylight hours. All the being said, I found this to be a solid start to a new series. The good/evil thing is very intriguing and I can’t wait to find out what happens next. I received an advance review copy of this book that I have chosen to review. The Delphi Effect RELEASE DAY! Today is release day for The Delphi Effect by Rysa Walker, the first book in The Delphi Trilogy. I am so excited about the start of this trilogy. This is going to be one of those series that I stalk, because I just finished reading this book yesterday and I am so ready for the next two. You can read my original review here. The Delphi Effect by Rysa Walker is the 1st book in her newest series, The Delphi Trilogy. This book caught me completely by surprise! I absolutely loved it. It has all those different paranormal elements that I love so much and I’m definitely on board for books 2 & 3. Pretty much now would be nice. If Rysa Walker’s name sounds familiar, its because she wrote The Chronos Files. The first book in that series, Timebound, was the Grand Prize winner in the 2013 Amazon Breakthrough Novel Awards. So now that’s on my reading list too. I would recommend this for those of you that love paranormal books. Many of the characters have some sort of special “power”. You’re introduced to Anna first and get to know her and her best friend/foster brother Deo (an attractive Hispanic guy that is definitely questioning his sexuality). Anna has a “hitcher” named Molly inside her head. A hitcher is a ghost that has not passed on and feels they have some type of unfinished business. Molly is a young black musician that was murdered and she is determined to let her police detective grandfather know who is responsible for the death of her and her mother. The problem with this, is that her grandfather is not a believer in the paranormal… so he just thinks Anna is crazy and possibly trying to scam him. This initial situation introduces Anna and Deo into the world of The Delphi and it seems their lives will never be the same again. There is a bit of a romance, but the romance in this book is it’s weakest element, so it’s not for those of you looking for strictly romance. Towards the end it seemed like the romance was being set up to play a much bigger role in the next book, so we’ll see how it goes. I can’t wait! The Delphi Effect releases October 11, 2016.